Let’s take a little bit of a closer look at these picks and other shopping tips. Incorporating myofascial release into your pre- and post-workout routine can improve two valuable aspects of your workout: warm up and recovery. Myofascial release is a technique that was adopted by masseuses and therapists in the past to treat stiff, sore muscles. The act of focusing on a particular area on your body through applying sustained pressure helps loosen your muscles, leading to more flexibility and an overall better feeling body. A foam roller can take the place of expensive options like a massage and be equally as effective. A foam roller allows you to target and massage problem areas ensuring you better workouts and faster recovery times. This is a proven alternative for anyone noticing stiffness in their muscles and joints after workouts, and is easy on the wallet too. While massages can average $100 per hour session, an effective foam roller can be as cheap $20, and last years. So what are the features to keep an eye out for when shopping for your first foam roller? Determining the foam roller with the right density for you depends on the situation. Roller density levels can range from low to firm and cater to different situations. Depending on your pain tolerance and workout regimen, there is a correct density for you when choosing the ideal roller. Medium and high-density rollers are great for deep pains and soreness in your legs. But if you’re unsure or just starting out, maybe give a light or medium density roller a try first for a less intense experience. Some rollers are smooth, some have grooves or bumps on them. The textured foam rollers are perfect for that deep tissue massage you so deserve after a long gym session as they really dig into those problem areas. Depending on the area on which you are focusing, the length of your roller can provide optimal relief. Longer rollers can be a nice solution to larger body parts with a less focused approach while shorter rollers are great for a more specific area and are also very convenient for travel! After scouring the Internet for the top foam roller options for legs, here are some affordable products worth checking out. Hopefully, this helps when deciding which roller fits your needs best! Overview: This roller’s top priority is deep tissue relief as you can see with the overwhelming texture that it offers. You can take a firm hold of your rolling with the easy grip handles that allow maximum comfort and control, or you can opt to lay your problem area on the roller as it is just as effective without using the handles. Measuring in at approximately a foot and a half and only 11 ounces makes this a great travel roller for the busy user, or someone concerned about lack of space. The Doeplex Muscle Roller is a high value, and high performance, option for anyone in the market to relieve muscle and joint soreness. Why I like It: You can’t go wrong with the size of the product. A roller just over 1 foot long can be taken out in your dorm room, apartment, hotel room, or home gym without the worry of lack of storage space. The fact that it’s so lightweight also makes it an attractive pick. If you are a beginner roller, finding the right position and leg location can be awkward. But not with handles to control where you roll, and the amount of pressure you apply. You can also request some assistance from your significant other after a rigorous day at the gym and the handles create comfort for a more effective massage. Potential Drawbacks: A couple of things immediately stand out as potential drawbacks of this product. One thought I had on first glance is that the texture could seem intimidating to a beginner. Some users mentioned how it put almost too much pressure on their bodies, leaving them in worse shape than before. While it does mention the “deep tissue” purpose, some were looking for a gentler experience for their first go round. Another nitpick is the color. Neon green hasn’t been my go-to color choice since 1990. Check the latest price & read real user reviews of the Doeplex foam roller on Amazon. Overview: Unlike the last roller, this particular product is you more basic option to get started. There are a few differences that are obvious at first glance. The first is the price. You may be wondering why this model is more expensive than the previous roller I covered and the main reason is the size and durability. The EVA Foam Roller measures in at exactly a foot and a half and a few ounces heavier than the Doeplex with a wider width. You are still able to travel without any problems with this model and the consensus is that the durability of this roller is unmatched for something this inexpensive. The width and firmness of this particular roller are perfect for larger areas of your lower body like your hips, glutes, and hamstrings. 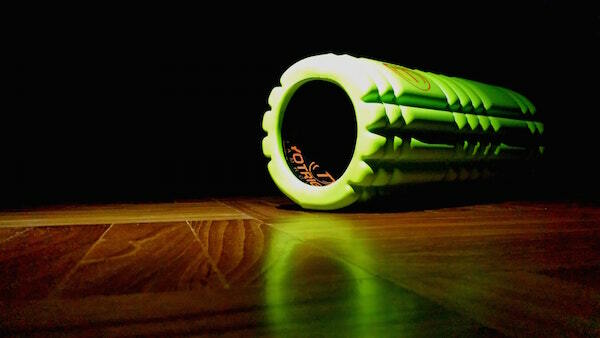 Why I Like It: This is your prototypical entry-level foam roller. While the reviews are very high on the user’s positive experience with rubbing out soreness, I also love how versatile this product is, with the ability to double as a tool for pilates, yoga, and other floor stretches and exercises. There is nothing better than a multi-dimensional product that can save you money and improve your workout. It doesn’t hurt that this foam roller is eco-friendly. Not only does that make you feel like a contributing human being, but you know that your foam roller doesn’t contain anything that could harm you in the long run. Potential Drawbacks: Sometimes true foam rollers aren’t always perfectly round which can make for an uneven session. This could be due to shipping issues, poor product development, or wear and tear after many uses. This roller also may be too firm for your personal preference. Check the latest price & read real user reviews of the Professional Grade Premium EVA foam roller on Amazon. Overview: This roller has it all. It is firm, with its hollow PVC pipe design, it is durable, and it will take your soreness and roll it away in minutes. Your muscles will thank you after this bad boy gets its grooves into your body. With a larger base, the Planet Fitness Muscle Massage Foam Roller will be more apt to improve stiffness in larger body parts like your glutes and thighs. Also, the medium-density foam offered is a superb contrast to the firmness that the hollow center offers for support. Why I Like It: If you’re willing to invest a bit more into your fitness and recovery, why not start with one of the best products on the market? The price won’t force you into a month of rationing beans and rice for your meals (unless that’s your thing) and for the amount of relief and the results it will yield, the price is on point. The reviews are in, and almost everyone mentioned how amazing they felt after having a roll. The texture is perfectly designed to poke and prod at just the right muscles, which make for the total package in foam rollers. Potential Drawbacks: This is one of the heavier foam rollers I researched, and while you won’t have to worry about a hernia lugging this around, it can add up while traveling. Also, for some, the hard hollow middle may not be the best option. The medium density foam can make up for a little bit of that, but some need the ideal mixture of firm yet comfortable to make this product worth the price point. Check the latest price & read real user reviews of the Planet Fitness muscle massager on Amazon. The foam roller can have immense benefits to your overall health and well-being. While researching what’s out there, the one thing I can’t stress enough is to ensure you have the proper firmness for your body. If that means purchasing multiple versions of rollers for certain body parts and soreness levels, then so be it. This isn’t where your foam roller rabbit hole has to end. You can find a texture pattern and firmness that is right for your body or ailment with a little digging. But for my money, if I were looking to get started with a foam roller specifically for sore legs, I’d spring for the high-end Planet Fitness massager (Amazon link) and give it a try. Seemingly everyone who tries it loves it, and it’s sure to be a great investment in the long run. Whatever you need to reduce soreness and add better motion to your body is out there, and is a worthwhile venture to keep you fit and add some years onto your routine.